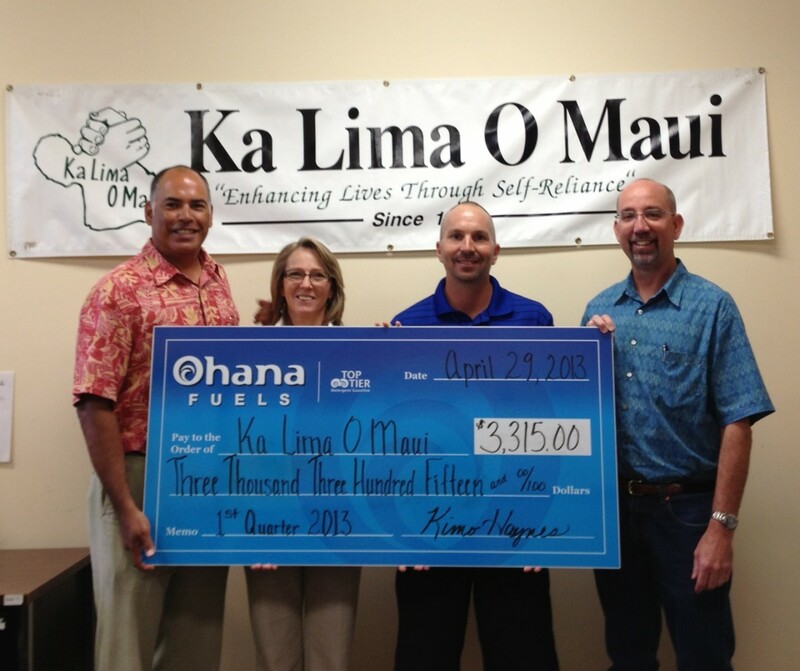 Ka Lima O Maui is the proud recipient of a $3,315.00 donation from Ohana Fuels. Ohana Fuels contributes a portion of each fuel sale to a non-profit entity providing services in our local community on a quarterly basis. Ka Lima O Maui, a private Not for Profit organization with the mission of “Enhancing Lives through Self-Reliance” for persons with disabilities through employment programs, was selected as the beneficiary for the Ohana Fuels sales from the quarter ending March 31, 2013. The funds received will be used to purchase much needed equipment for its grounds crews that employ 50 persons with disabilities. We are extremely grateful for the support that Maui Petroleum and Ohana Fuels has provided Ka Lima O Maui over the years. Ohana Fuels branded its first location in July of 2012 at Minit Stop Makawao followed by Minit Stop Pukalani and Minit Stop Wakea.